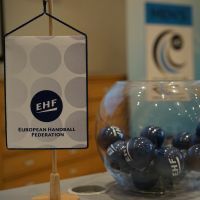 DRAW REVIEW: The Men's EHF Cup defending champions Frisch Auf Göppingen will meet the Swiss club in the Qualification Round 3 as the draw in the EHF Office determined all 16 pairings of the last elimination round before the group phase. Frisch Auf Göppingen who lifted the Men's EHF Cup trophy last May in Nantes will start their title defence in this season's Qualification Round 3 against Switzerland's Pfadi Winterthur as all 16 pairings of the last elimination round before the competition's group phase has been drawn at the EHF Office in Vienna. Markus Glaser, the EHF Competitions Senior Manager together with EHF Comptrollers Wolfgang Gremmel and Bozidar Djurkovic. Göppingen, who beat the 2016 EHF Cup Finals hosts HBC Nantes in the final game of the previous season, will play the first game at home and move to Switzerland next week. The first leg of the Qualification Round 3 takes place on 19/20 November, the second leg will follow one week later. The 16 winners qualify for the group phase, which will commence on 11 February. Apart from the reigning winners there are three more participants from the German bundesliga and all of them will face adversaries from former Yugoslavia as SC Magdeburg will play against RK Nexe, MT Melsungen lock horns with HC Zamet (both Croatia), while the 2015 winners Füchse Berlin meet Slovenian runners-up Rk Gorenje Velenje in the re-match of the 2015 semi-final. In other pairings, the French runners-up Saint-Raphael Var Handball take on 2013 Challenge Cup winners SKA Minsk from Belarus, while another high class encounter features Spanish Reale Ademar Leon facing KIF Kolding Kobenhavn from Denmark. The third team of the last season Fraikin BM Granollers will play for the group phase ticket against Ukraine's ZTR Zaporozhye.